End of Summer / Early fall is when we are looking to use up all the excess tomatoes from the backyard garden. 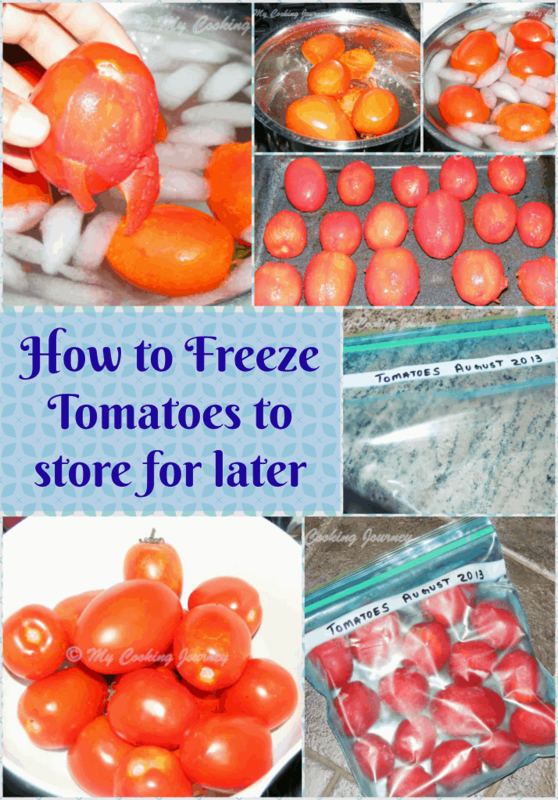 Freezing tomatoes has been my preferred method to store them for a prolonged period. 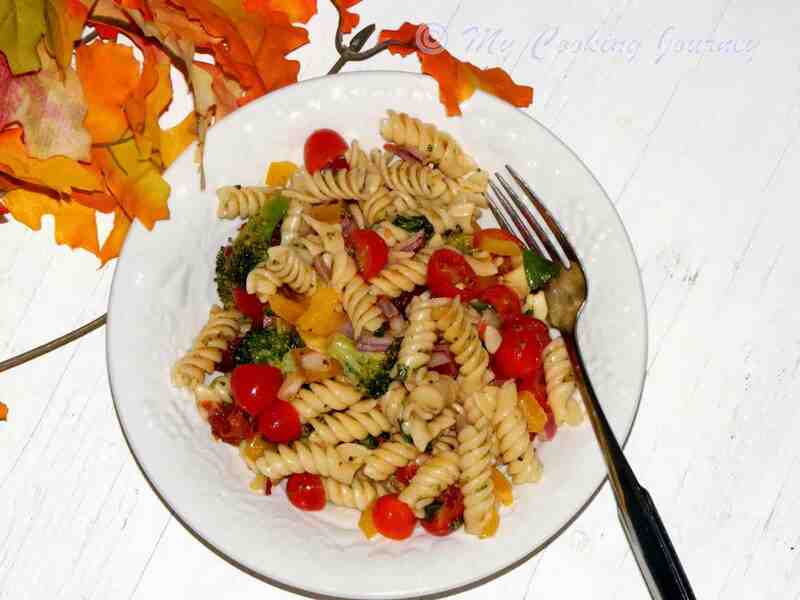 Late summer is a time when we backyard gardeners are bombarded with overload of vegetables. 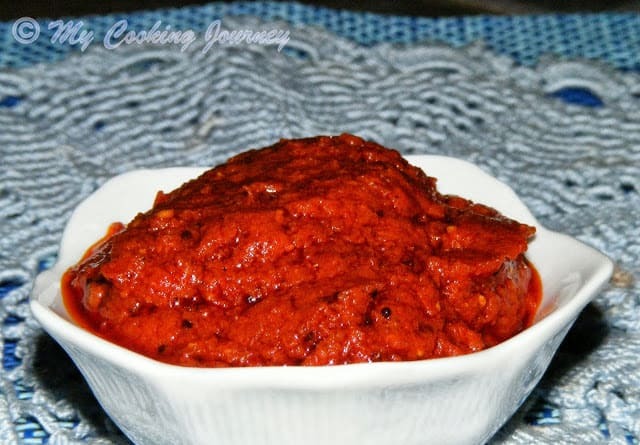 Tomato is one vegetable that I always have abundance of. I use tomatoes a lot and hence when planting in spring, I plant many varieties of them. When they are ready to pick, I usually end up having 10 – 15 lbs of them every week. I use them to make pickle, sauce and jams, but still have a lot that I like to preserve. In winters when the tomatoes are very expensive the ones I store usually come in handy. I have tried canning whole tomatoes, but feel that it is more work and I somehow so not like the texture of the canned ones. That is when I started freezing them. 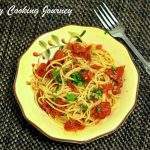 This technique of preserving tomatoes works great. I have been using this procedure for the past 8 yrs and it has never failed me. 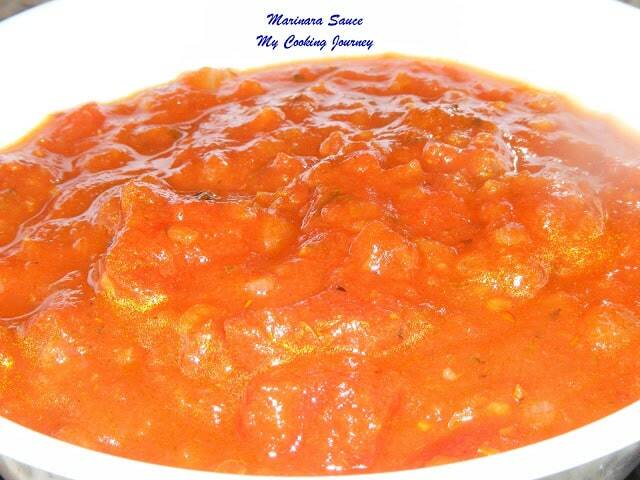 The tomatoes that are frozen come in so handy when making subzis and dals. They also work very well to make soups. 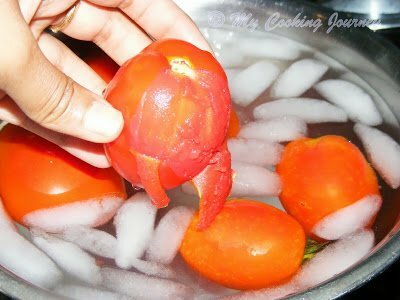 Certain vegetables could be just chopped and frozen, but to freeze tomatoes we have to blanch them and then remove the skin. This way the tomatoes are frozen inside out and removing the skin also helps to keep it fresh and bug free. The Roma tomatoes works great for freezing and for this reason, I always plant plenty of this variety. 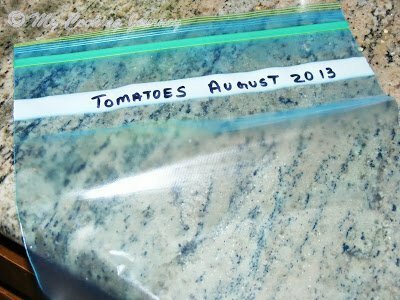 I freeze these tomatoes in labeled gallon size FREEZER bags. Please make sure that you use the freezer bags and not the storage bags. This will keep the tomatoes fresh and frost free for up to a year. Choose ripe, firm tomatoes without bruises. Wash them well and remove the stems. Boil water in a large pot. The larger the pot, more the tomatoes that could go in at one shot. 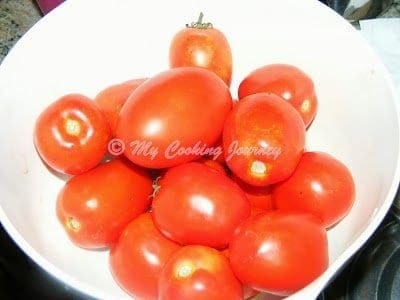 I usually do not add more than 6 tomatoes at a time just to keep the water temperature at boiling. 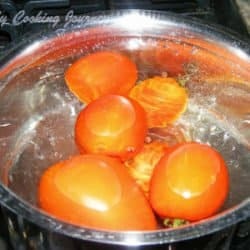 When the water comes to a rolling boil, add the tomatoes in slowly. Let the tomatoes sit in boiling water for 60 seconds. In the meantime, in a large bowl add plenty of ice and about 4 cups of water. Keep it aside. 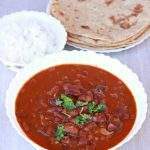 With a slotted ladle, remove the tomatoes slowly from the hot water and transfer it to the bowl of cold water. Let it sit for 60 seconds and then slowly peel the skin. At this stage the skin would come off very easily. 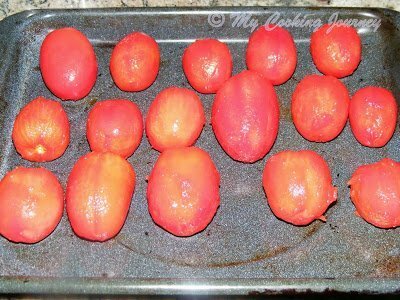 Line the skinned tomatoes on a baking sheet. Make sure that the sheet would fit your freezer without any problem. Wait until the water comes back to boil and then repeat the same steps with the rest of the tomatoes. Fill the sheet and keep it in the freezer for about 4 hours. By now the tomatoes would be hard as a rock. Label gallon size freezer bags with date and content and keep it ready. 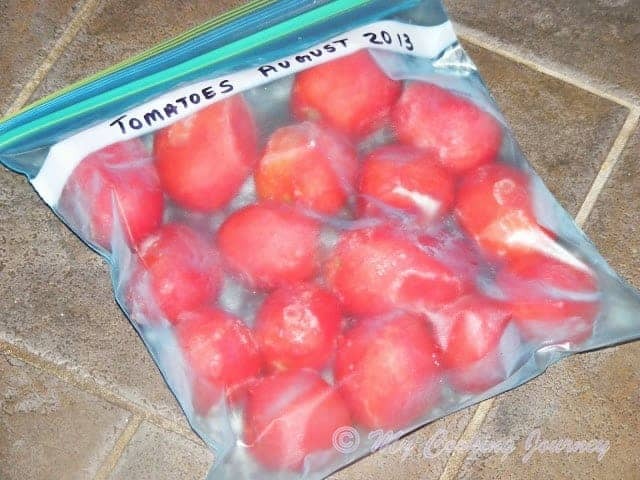 Transfer the frozen tomatoes to the labeled bags and return the bags immediately back into the freezer. Make sure that you layer the tomatoes in a single layer. This way they would stack up well in the freezer. Enjoy the tomatoes through the year. Very useful post ! 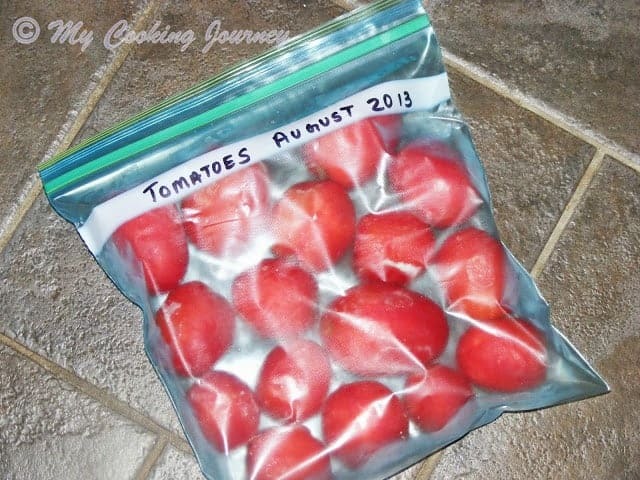 That's a good idea of preserving tomatoes.. This is a wonderful post. .very useful and interesting. .very well explained.we normally buy organic tomatoes. .wonder which variety it is?.. never thought of finding. Wow that's really cool..nice to see these frozen and stored..and lucky to get so much of fresh crop..very nice.. Very useful for people growing their own tomatoes or when tomatoes are very cheap. 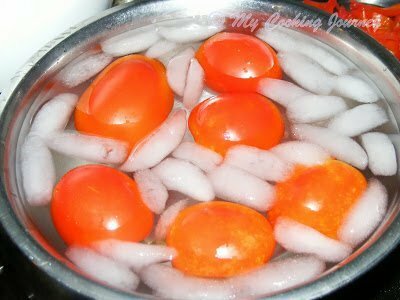 Thats an excellent and brilliant idea of freezing tomatoes, even i do the same way too. 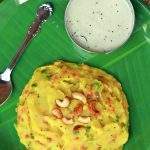 Wonderful way to preserve veggies in this days when vegetables becomes so costly. very helpful post ..thank you. oh this way you can have backyard tomatoes for the whole year… thanks for sharing this great info!!! That is an interesting way to preserve tomatoes. I usually cut them up and then freeze in small cups later transfer into ziplock bags. Very informative.. Never knew that we can store tomatoes..
Well written post Sandhya!Its nice toe preserve and use the garden produce. How do you store your extra peppers? If it is bell pepper, I wash them, dry them and the cut it into pieces and store. I usually do three different type of cuts for different ways to use in recipes. I slice them, cut it fine and also cut it in 1 inch pieces, so that depending on what I am making i use them. The green chilies and any other kind of hot peppers, I either freeze them whole or chop them and the freeze. make sure you wash, dry and remove the stems before processing. Depending on their size I decide if I would freeze them whole or chop them. the tiny ones, i freeze them whole, so i can sue it in recipes that require grinding the chilies. Hope I answered your question! Btw I really envy your vege garden, especially the indian veges. That's agreat tip when you have loads of tomatoes. I wonder how I missed this post! Looks like there is a gap and let me double check whether I have seen all the posts…dont want to miss any of the info!! 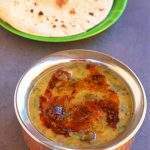 Great post Sandhya..You should do more of these, its very helpful! 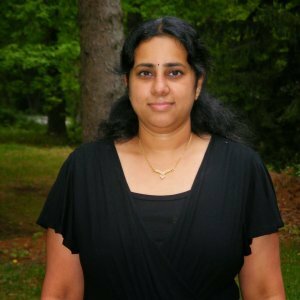 This is a great post Sandhya. 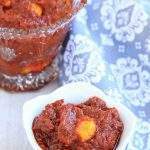 I made some pure ans stored tomatoes but this looks like a better option. This was an informative post and so beautifully explained. 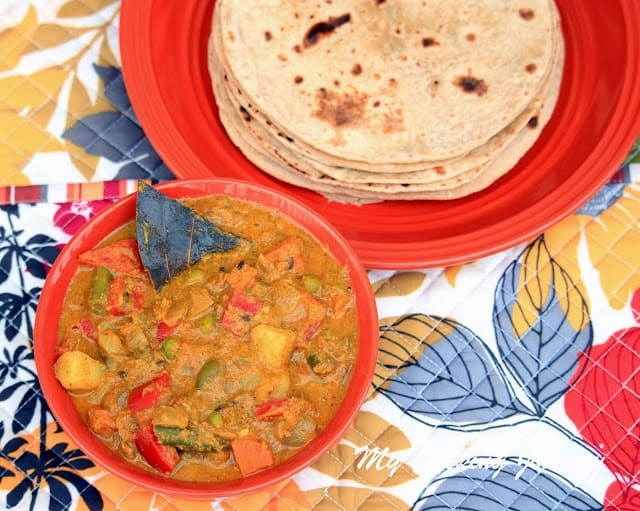 Although we hardly get to freeze veggies in India becasue of our small refrigerators and availability of fresh veg and fruits throughout the year. I did freeze tonnes of strawberries this year though!